Take a minute to imagine a world in which you don't need expensive gaming hardware to play the next big budget release. A world where all you ever have to do is open up the Chrome browser, select a game you'd like to play and then have it instantly begin without a lengthy download. Well, that will soon become a reality when Google's cloud gaming service, Stadia, is launched. From Chrome tab to 4K, 60fps game, in five seconds. No installation required. Ever. Google promises that Google Stadia's cloud computing power is the equivalent of a console running at 10.7 GPU terraflops, which is more than the PS4 Pro and Xbox One X combined. If Google delivers on this promise, then it could be a total game-changer – both figuratively and literally. Rather than having to invest in high-end hardware, Stadia (which was prototyped under the Project Stream moniker) allows you to use whatever computer you have around to play videogames – removing the high barrier to entry most users face. Instead, Google handles all the heavy lifting on its own servers, which can process the latest version of the game at high resolutions and frame rates, encode it into a stream, and deliver the stream to you over the internet. 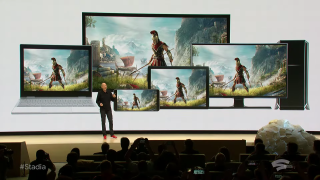 At launch, Google has promised that Stadia will support desktops, laptops, tablets and smartphones - without the need for a hardware box, instead running on Google's own data center. We got our first taste of the service during an extended beta that ran back in 2018, and now it's been fully revealed at GDC 2019. There's still much to learn as Google's Stadia rolls out, but based on what we played last year, the renamed Project Stream serves as an impressive showcase of what the future of cloud gaming could look like, flipping the video game industry as we know it on its head. What is it? Google's big move into gaming – a 'Netflix for gaming' streaming service that's a true console competitor, one to rival (and potentially lead) the next generation of game-play. When is it launching? At some point in 2019, with launch territories including the USA, Canada and UK. Latest rumors suggest another update, teaser and more details will be on their way in June 2019. How much will it cost? No official details yet – it remains to be seen whether you'll need to pay for individual games, or pay for a subscription pass, or a combination of both. Good news: as long as you've got a stable and fast internet connection, and you're using a recently desktop version of the Google Chrome browser, you've got all you need to get started with Google Stadia. Getting started with a videogame on Stadia is as simple as opening a new tab up in Chrome and going to the service's Stadia.com homepage, or even jumping from a YouTube video link about the game. To get started, Google will prompt you to run a connection test that checks your internet bandwidth, the latency between your computer and the servers, and any data loss. Google requires a streaming rate of 15Mbps, latency below 40ms, and data loss below 5%. With these requirements met, you’ll be ready to dive into a game. The beta of Project Stream offered Assassin’s Creed Odyssey, which is nothing short of a demanding title. When you launched the game in your Chrome tab, it would go fullscreen, and run exactly as if it has been launched on a proper gaming computer (except without a deep graphics settings menu). You can play with a keyboard and mouse or connect a game controller and play that way. All of your inputs on the computer get sent over to Google’s servers, processed in the game, and everything happening gets streamed right back to you. This is why that latency is so important, because you can’t have a good game experience if everything you do in the game shows up a second later. The limits of Stadia are still being detailed, but Google has stated that Stadia will eventually be able to scale up to 8K / 120+fps frame rates, with 4K/ 60 fps play as the norm. That's way above the standard bar for quality PC gaming. All of your inputs on the computer get sent over to Google’s servers, processed in the game, and everything happening gets streamed right back to you. What you're effectively doing here is opening a new tab that pipes all your inputs to a high-end gaming PC that streams back the visuals and audio to your computer screen. This system is simpler than some others, which set you up with a virtual desktop that then remotely runs Steam, Origin, Battle.net, or what have you. In the case of Assassin’s Creed Odyssey on Stadia, you are still required to log into a Ubisoft account to play, but beta testers aren’t required to own the game. Stadia will also work well with Google Chromecast, which means you'll be able to stream its games straight to any TV using Google's streaming dongle, not to mention phones and computers. You'll be able to use keyboard and mouse or a gamepad to play Stadia, and Google's Stadia gamepad, a brand new piece of hardware, seems particularly smart. First off, the issue of latency – the gamepad itself connects directly to Google's cloud, which take a few of the steps out the data transfer chain, reducing the lag between your inputs being registered by the game. It also has a dedicated Google Assistant button, which Google claims will be loaded up with information on the title you're playing, offering tips when needed, or allowing you to access special in-game features from developers. In addition, it'll support cross-platform multiplayer – so long as the other major game players want to take part, of course. It’s unclear at this point whether Google will require players to buy games and pay for the streaming service in separate transactions, or whether access to select games will be bundled into the service. What games will be available on Stadia? Through the Project Stream beta, the only available game was Assassin’s Creed Odyssey. While this didn’t give us much idea of what games Google will offer in the future, it did give us a good idea of what games Google's Stadia could be capable of offering. For 4K at 30fps and high settings, the recommended specs bump up to include 16GB of RAM, a more powerful AMD Ryzen 1700X or Intel Core i7 7700 processor, and a beefier AMD Vega 64 or Nvidia GeForce GTX 1080 graphics card. With Stadia streaming in video, this limitation could be eradicated, bringing AAA gaming to even entry level laptops. In addition, id Software confirmed Doom Eternal is coming to the Stadia - with the team only taking a few weeks to transfer the title onto Google's cloud streaming service. id Software's Marty Stratton revealed Doom Eternal is capable of running at 4K 60fps at native HDR on Stadia. If the service can handle Assassin’s Creed Odyssey at 1080p 60fps and Doom Eternal at 4K/60fps, Stadia is going to be capable of playing a whole lot of games at these settings. Other major titles could easily see support on the service. Games with a major online focus may have dicier prospects on Stadia. Since competitive online games are often fast-paced and require split-second reaction times, the extra latency introduced by streaming will likely be an issue for serious competitors. But Stadia looks better placed to beat this issue than other similar services, with infrastructure that no-one else has in terms of fibre optic cabling, and a Wi-Fi controller that connects directly to Google's cloud. That could mean online multiplayer titles such as Fortnite supporting thousands of players rather than just hundreds. A recent Chromium update also added support for Nintendo Switch controllers to Google's browser, so it looks like we could be getting more than just streams of PC releases. Google also announced the launch of Stadia Games and Entertainment. This will be a new arm at Google, with the sole aim of designing games exclusively for Google's game streaming platform. As well as Assassin’s Creed Odyssey, Ubisoft has indicated a few upcoming games will also make it on to Stadia when it's released, including multiplayer motor-cross game Trials Rising, naval warfare game Skull and Bones, as well as strategy game Anno 1800. Google Stadia will also allow for developers to implement split-stream local couch co-op easier, through Stream Connect. This should allow players to not only view but interact in each other's worlds. But, perhaps the biggest development for content creators and their viewers, is Crowd Play which will allow viewers to play games with their favorite streamers by simply clicking a button. The big focus here is on designing a system that's both easy to play and easy to show off to your friends. To that end, Stadia will send both a 4K signal to both your device and to YouTube simultaneously, allowing you to record what you're doing. The last feature Google showed off was called State Share - i.e. the ability for you to share any spot in your adventure with anyone via a Google link. One use case would be that State Share would allow you to record your spot in a tough boss fight and challenge your friends to beat it. If you're stuck, either in your game or your friend's, Google Assistant integration will allow you to access guides and walkthroughs on-demand. What was Project Stream like to use? At its best, Project Stream was good. At its worst, well, Google won’t let you play below a certain threshold of quality, and you wouldn’t want to anyway. We tested Project Stream on varying setups. We played on an unstable 2.4GHz Wi-Fi connection, a fast and nearby 5GHz Wi-Fi connection, and on an ethernet connection held steady and offered high bandwidth. Keep in mind this was without the dedicated hardware Google has now introduced. The highly dated Chromebook hardware didn’t hold it back from playing. We also played on a 5-year-old Chromebook, a 2-year-old Razer Blade, and a modern desktop gaming rig that would be happy to run Assassin’s Creed Odyssey at 1080p/60FPS on its own hardware. We even started one computer up while another was running the stream, and Google simply transferred control over to the second computer, with no stop in the stream. Across the board, we’d describe the experience as at least playable. The highly dated Chromebook hardware didn’t hold it back from playing. The biggest issues come from a bad connection: if the connection speed drops, so does the game quality, with lower resolutions, latency, and far more noticeable compression. That said, in our experience, the visual degradation came before the latency, so we were able to continue battling enemies smoothly even if they started to look like ghostly swarms of pixels. Overall, the graphics were fairly good throughout, especially when playing on a high-bandwidth connection using ethernet cables. Colors, shadows, and anti-aliasing look fine, and the frame-rate seems to vary between 30 and 60fps. The low frame-rate was one of the two issues we noticed. The other was compression. Most of the time, it’s not super jarring, but when there’s a lot of detail in a scene and a lot of movement, the compression turns it all into a bit of slop. Character faces become a blur and hard edges (noticeably the character’s hair) go soft. Will Stadia have fixed these issues by launch? It would seem to be a sign of the lower bitrate enabling this type of streaming, but the truth is that most of the time it’s unnoticeable, and would be even harder to spot if you weren’t looking for it (we were looking for it). Panning the camera and running through dense wooded areas in the game (and combining the two) were the only times we were turned off by the dips in visual quality. The experience isn’t mind-blowing, at least until you remember that it’s using so little of your computers processing power that you’ve literally got a full-system virus scan going in the background and nothing changed. The visuals are comparable to what you’d get on a console, except with compression artifacts here and there. And, with a stable connection, it compares rather favorably to in-home streaming on a Steam Link. While the price and service model Google adopts will go a long way in determining whether Stadia is worthwhile, we can say right now that its prototype works, and it looks good doing it. But, will Microsoft’s xCloud do it better? Will you be able to play Google Stadia on your phone? Although it hasn’t been confirmed by Google, it’s likely that Stadia will enable you to stream blockbuster games, which ordinarily would be exclusive to consoles or high-end PCs, on your smartphone or tablet. This could mean that when 5G rolls out at the end of 2019, or beginning of 2020, playing both mobile and traditionally non-mobile games on the go will be no problem at all – you could find yourself using the Stadia Controller along with your phone to play Borderlands 3 or Starfield on the train on your way to work, or in a coffee shop. You’ll also be able to cast your gaming from your phone to a TV or other screen, and use your phone as a tiny console on which to play all your games. It’s possible that computers and portable devices would have different libraries on Stadia, but since all the processing is done by Google, there’s no reason why playing console games on a phone isn’t a possibility if you have fast enough internet speeds.